The terms "astronomie" and "astrologie" are more or less interchangeable; it was understood that the astrological condition of the skies affects the weather and influences the seasons and times for planting and harvesting (hence even today the Old Farmer's Almanac provides detailed astrological information for the benefit of those whose labors may be affected by the skies. "Judicial" astronomy concerned the influence of the planets on the actions of humans, a subject of considerable debate. Here is a manuscript painting (from the Bibliotheque nationale in Paris) of the zodiac. In that image the Zodiac is shown surrounding the four elements (earth, air, fire, and water). Here is Aries (NOTE the dryness of the dead land into which the Ram is entering; the "drought" of March is seen there, as well as a more T.S.Eiot-like waste land). Here is Taurus (in which the action of the General Prologue takes place). Here, from the Tres riches heures du Duc de Berry is the month of April. 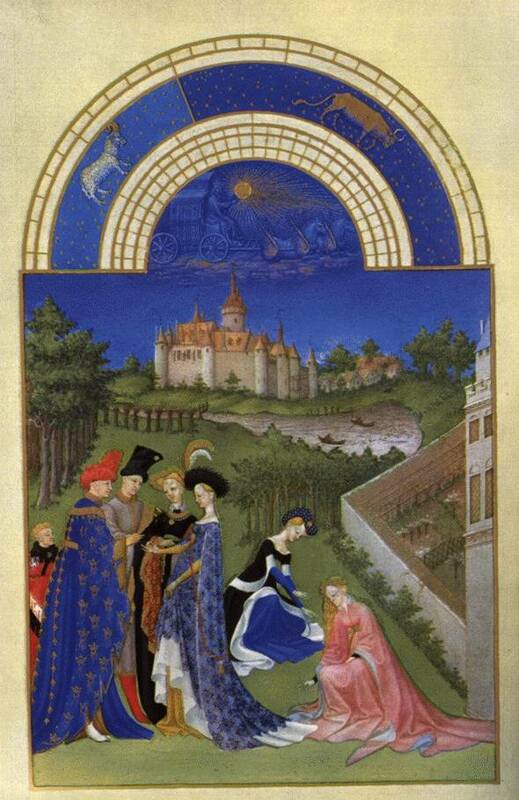 The zodiacal signs are at the top; a marriage is being contracted in the foreground. Even the rivers are apparently filled with fish, since in the background fishermen are at work. For a further explanation, see The Planets and their Children, compiled by Marianne Hansen at Cornell. Walter Clyde Curry, Chaucer and Medieval Science. J.C. Eade, The forgotten sky: a guide to astrology in English literature. New York, 1984, PR149.A798 E24 1984. John D. North, Chaucer's Universe. New York, 1988. PR1933.A7 N67 1988. (Impressive scientific knowledge but use with caution; astronomical references are often assumed when they are not necessarily there).